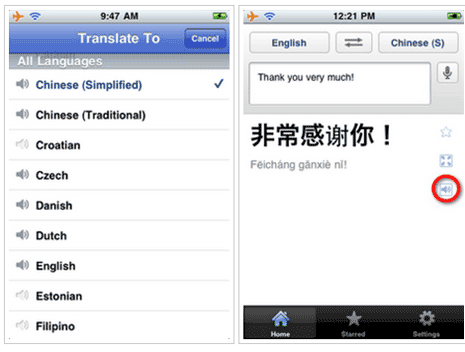 Do you want to perform quick language translation on your iPhone, iPad or iPod touch? 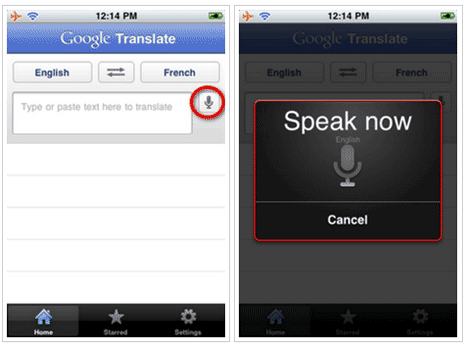 Download official Google Translate app for iOS devices from iTunes for your language translation needs. It allows you to translate words and phrases in more than 50 languages. You can simply speak phrases and hear the corresponding translation. 1. You can listen to translation loudly in about 23 languages. 2. Translate quickly by speaking instead of typing in over 15 languages. 3. Well over 57 languages supported for default text language translation. 4. Display and view language translation text in full screen mode for easy reading. 5. Bookmark and star favorite translations to view them offline. 6. Browse translation history even when offline to check on activity. 7. Also view additional dictionary results for single words or short phrases. Google Translate app supports translation between languages including: Afrikaans, Albanian, Armenian, Azerbaijani, Arabic, Basque, Belarusian, Bulgarian, Catalan, Chinese (Simplified), Chinese (Traditional), Croatian, Czech, Danish, Dutch, English, Estonian, Filipino, Finnish, French, Galician, Georgian, German, Greek, Haitian Creole, Hebrew, Hindi, Hungarian, Icelandic, Indonesian, Italian, Irish, Japanese, Korean, Latvian, Lithuanian, Macedonian, Malay, Maltese, Norwegian, Persian, Polish, Portuguese, Romanian, Russian, Serbian, Slovak, Slovenian, Spanish, Swahili, Swedish, Thai, Turkish, Ukrainian, Urdu, Vietnamese, Welsh, Yiddish.